Puppies under 4 months should be left home (until properly vaccinated). Sensitive or shy dogs should have brief introductions (at first) or contained in “small dog” areas only. Do NOT bring treats, toys or small children with you! Do NOT bring your intact males or females in season! Do NOT spend your time talking on a cell phone - please supervise your dog at all times. Consult your Vet before going to a dog park. Make sure your dog is current on all vaccinations. Consider off-peak hours for your first few visits. Leave if you think your dog is not having fun. Leave if YOU are not having fun! Spending time with your furry children should be a mutually beneficial experience. If your dog needs more exercise and socialization, and dog parks aren’t your “thing”, call Doolittle’s Doghouse to arrange a more intimate experience: 480-907-6400. 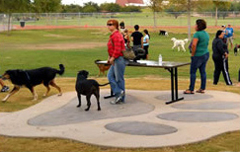 With its unique dog paw shaped pathways and convenient doggy water fountain, the Steele Indian School Park is a beautiful, well maintained dog park. Two fenced off-leash areas are available; one for large dogs and one for the smaller variety. 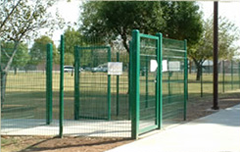 One of the largest dog parks in the area, the PETsMART dog park that is part of Washington Park has two large areas with six foot tall fences and double gates. There are separate grassy areas for large and small dogs and watering stations available. This dog park is handicap accessible. 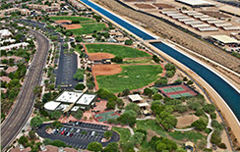 The Rose Mofford Park offers a great combination of sports fields, and exercise circuit and an area just for the dogs and their owners. There are two double gated areas for the dogs to run; one for larger dogs and one for smaller ones. 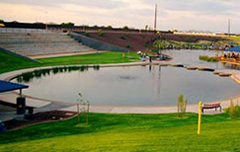 The park is also fully handicap accessible, making it a great destination for the whole family. 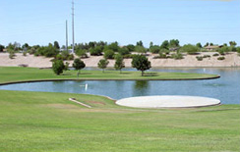 Ideal for small dogs and their owners, the Sahuaro Ranch Park offers a small off-leash area for dogs to run free. There are a few pieces of agility equipment available. This park is closed every Tuesday. The Foothills off-leash dog park has two areas that are used intermittently. One section is always open with an area for larger dogs and an area for smaller dogs. When the East side section is open, it includes an agility course. This park is closed every Wednesday. 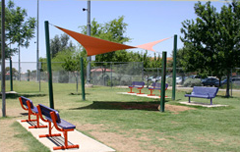 The Chaparral dog park in Scottsdale boasts some of the best and newest in dog park amenities. There are separate sections designated for passive or active dogs. There are play features, water fountains, evening lighting and seating available. Those looking for a smaller off-leash dog park will enjoy taking their companion to Scottsdale's Horizon Park. Be aware that it floods after it rains, and the park will not be accessible then. The dog park is closed on Thursdays from 9:30 am - 12:30 pm for regular maintenance. 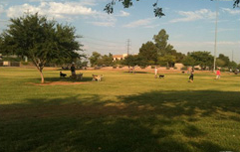 The Vista Del Camino dog park is a half acre off-leash park for dogs and their owners to enjoy. There are shaded areas available and the entrance is double gated. 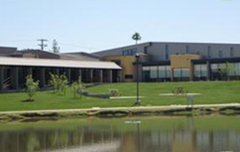 Parking lot is located off of Hayden Road. If you're looking for the ultimate in dog parks, Cosmo Dog Park is the place for you. There are separate areas for timid and active dogs, nighttime lighting, a beautiful memorial at the entrance and amenities for dogs and people alike. 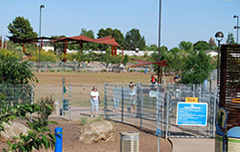 With separate fenced areas for timid and active dogs, the Crossroads dog park accommodates dogs of all kinds. There is only limited evening lighting, and it is only on the South side of the park.